Carl's Jr. has been spotted testing the use of muffins as the "buns" for their breakfast sandwiches. There are two varieties being tested: the Cornbread Breakfast Sandwich and the Blueberry Muffin Breakfast Sandwich. Each sandwich features your fast food breakfast stalwarts--egg, bacon or sausage, and cheese sandwiched by either two cornbread muffin tops or two blueberry muffin tops (baked in-restaurant). According to Foodbeast, the two different muffin breakfast sandwich were testing at two separate locations in Orange County here in Southern California (the blueberry version in Costa Mesa and the cornbread version in Santa Ana). They were each $2.99 a piece. The muffin sandwiches look to be an attempt to find the next savory-sweet hybrid sandwich. But besides McDonald's McGriddle, similar sandwiches don't tend to have much staying power. 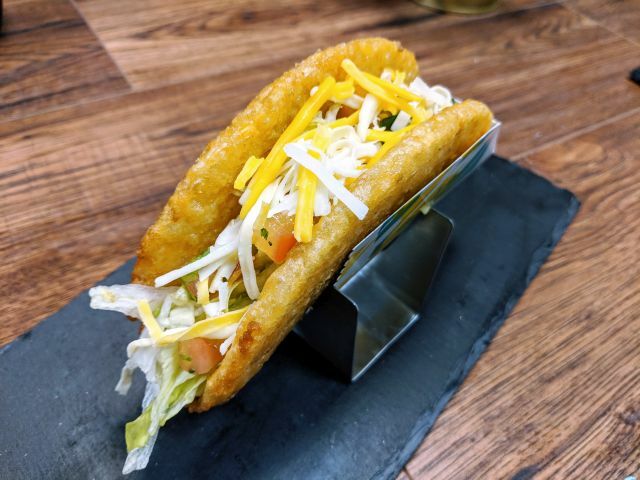 Jack in the Box offered a Waffle Breakfast Sandwich for a bit and coined the term "swavory," Taco Bell tried the Waffle Taco, and Carl's Jr. did a French Toast sandwich, but none of those sandwiches are around today. I reached out to Carl's Jr. for comment but was told they don't share information regarding test items. They were however kind enough to share the photo shown above.